Graham’s are one of the most outstanding producers of vintage port. Their wines are renowned for their remarkable, richness, concentration and firm tannic strucure which combines to give them remarkable longevity. production is centred on the Malvedos vineyard, one of the most famous within the Duro region. Grapes from Malvedos are responsible for providing the famous house style: intense floral notes, opulent berry fruit flavours and racy flair. The Malvedos vineyard also lends its name to the famous single quinta produced in years when there is no declaration. Graham's have a history spanning three centuries, dating back to 1820 when two brothers, William and John Graham, established the business in Oporto. 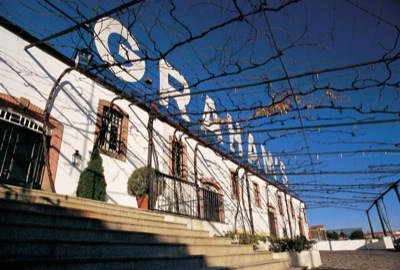 Today, Graham’s is owned by the famous Symington family, who continue to produce some of Portugal’s finest wines. Their Vintage ports are only produced in the best years, and these ports are always superb quality and long-lived. Vintage Port is the traditional gift for marking special family occasions, particularly the birth of a child. Vintage Port has an extraordinary ability to age gracefully for 75 years or more, developing from a structured, powerful and robust young wine into a sophisticated and elegant wine in middle age and then on to a delicate and ethereal beauty that will continue for decades. It has long been a tradition for special occasions to be marked by the laying down of vintage port from the year of the event. Problematically, due to the fact that a vintage year is normally only declared in the second year after the harvest, the recipient of the gift often has to remain empty handed until sometime after the celebration. The Symington family is pleased to announce a limited release of 400 cases of Vintage Port from its Stone Terraces vineyards, which occupy just 2.9 hectares of its iconic Quinta dos Malvedos, of which the total area under vine is 90 hectares. Acquired in 1890, this property is acknowledged to be in one of the Upper Douro Valley’s most favourable sites. It has been the source of some of the greatest Vintage Ports ever made. The 2013 Graham´s Late Bottled Vintage Port (LBV) is a superb wine, selected from the finest production of a very good year. Whereas vintage Port spends two years in casks and then matures in bottle, LBV is matured in seasoned oak and then bottled at between four and six years of age; hence the term, ‘Late Bottled’. Its ageing process encourages the wine’s development; at the time of bottling it is therefore ready for drinking without the need for decanting. Graham's Crusted is a blend of carefully selected young ports from two or three vintage years, bottled without any fining or filtration in the year indicated on the label. After many years of bottle ageing in ideal conditions in Graham's cellars in Oporto, it has developed the magnificent bouquet and flavour unique to bottle matured wines. Excellent deep ruby colour, with layer upon layer of rich concentrated red and black fruit aromas. On the palate packed with fruit flavours and with floral hints of eucalyptus and mint. Well balanced and a long and lingering finish. Malvedos JEROBOAM 3lt Bottle Limited edition 1 of 60 produced. A very rare 3 lt Bottle of the very limited 2012 release. Only 60 of these were made! A lovely complex nose with excellent sweet and rich fruit aromas such as black cherry, black currant and blackberry. On the palate it is packed with solid, structured, rich and intense black fruit flavours and an admirably long finish. Excellent deep ruby colour, with layer upon layer of rich concentrated red and black fruit aromas. On the palate packed with fruit flavours and with floral hints of eucalyptus and mint. Well balanced with a long and lingering finish. Graham's Crusted is a blend of carefully selected young ports from two or three vintage years, bottled without any fining or filtration in the year indicated on the label. After many years of bottle ageing in ideal conditions in Graham's cellars in Oporto, it has developed the magnificent bouquet and flavour unique to bottle matured wines. An outstanding port rating 92 points. An outstanding fully mature port rating 92 points. The 1977 Graham's vintage port is a stunning example of a fully declared vintage. Intense candied fruit aromas intermingle with cinnamon and clove spice leading to a palate of sweet jammy figs and milk chocolate notes. A fine port with long lingering finish that is ready for drinking now but, obviously as with all great ports, has many years ahead of it.